Not all perforated music is the same! 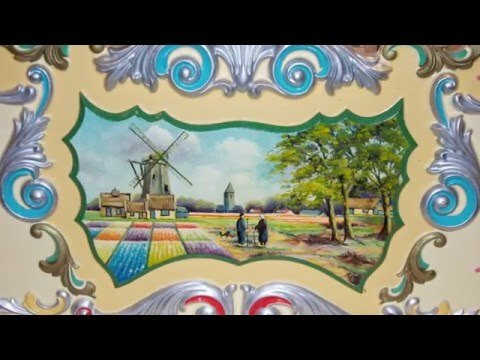 No matter how well the organ is restored, or however carefully the façade has been re-decorated, the final test must come with the music it produces. 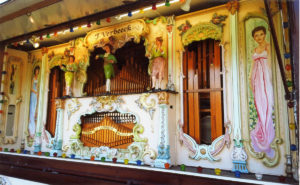 Our arrangements are always specially made for the organ type in question. We do not use MIDI files downloaded from the internet, or alter an existing organ arrangement to fit another; in many cases, although offered at a lower price, this type of music rarely does justice to the instrument. 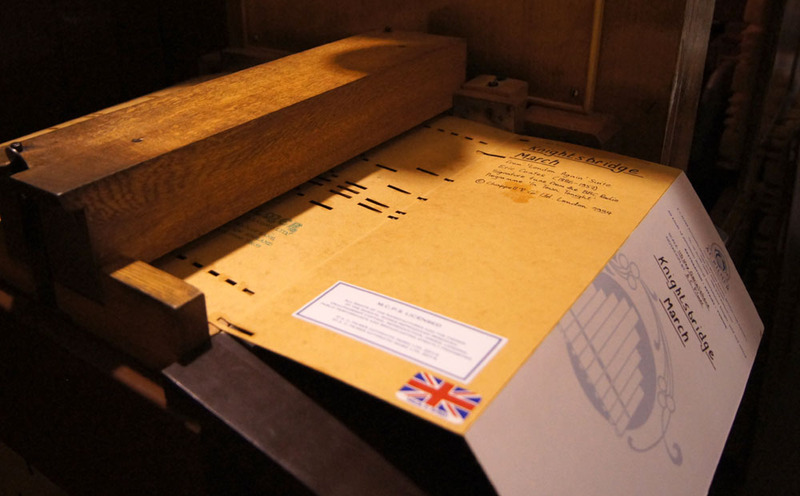 A new music book, perforated with round holes, being played by a small German fair organ. 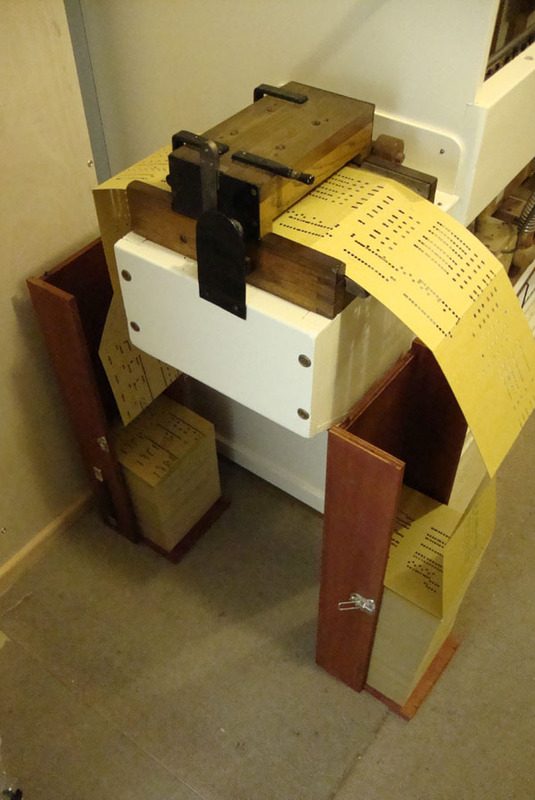 Note that a special box is in use, allowing a long programme to be played without the attention of an operator. The closed box protects the music when not in use and is ideal for commercial use. We can make boxes of any width to order. As Publisher and Composer Members of the Mechanical Copyright Protection Society (MCPS) we are licensed to make arrangements of copyright works on which a statutory copyright royalty is levied. Our music is also protected by the Performing Rights Society (PRS) and Phonographic Performance Ltd. (PPL), of which we are also members. Some music books are marketed without any copyright payment being made, putting them in the same category as bootleg CDs and DVDs. Many of our book music customers tell us that they are very pleased with the quality and durability of the cardboard we use for our products. This cardboard is British made, not imported and is made up into book form in our own works, by hand, using special machines and equipment. Customer feedback shows that, whilst some music is available at prices lower than ours, the quality of the card stock used leaves much to be desired, and in some cases, when subjected to hard use, does not last more than a few seasons. 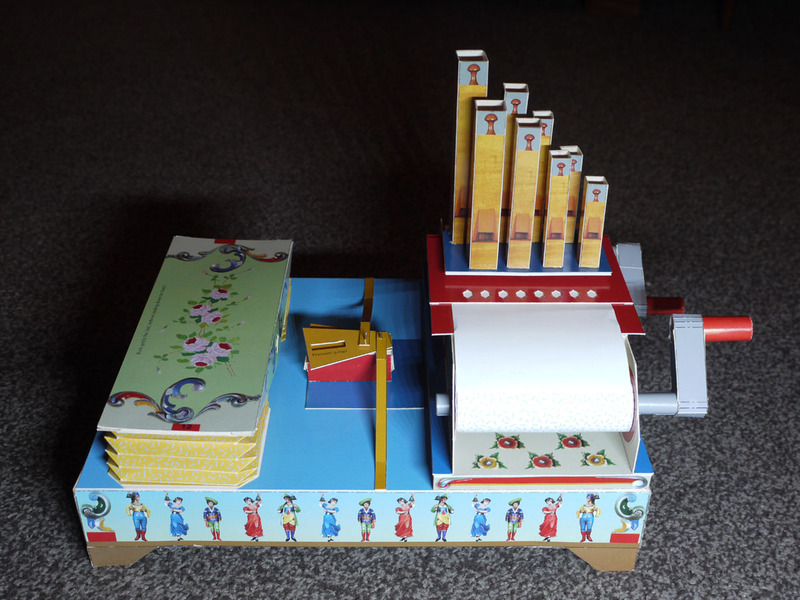 Perforated cardboard book music was never a cheap, throw-away product – why should it be so today? Blank card can be supplied to order. Contact us for prices. It makes good sense to purchase carefully produced book music on the best quality card. Click here to download a pdf file of some of the scales for which we have already produced music books and rolls. Contact us if your organ has one of these scales, as we can most likely furnish a list of music available. We can also supply re-cut music rolls for a number of orchestrions and organs including Gebrüder Bruder models 107 and 111, Welte Cottage and Concert orchestrions, Welte Philharmonic, Hupfeld Helios, Weber Unika and Grandezza etc. Contact us with your requirements. 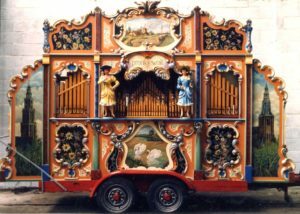 We can also supply new metal discs from original factory arrangements for several types of musical box including, Polyphon, Komet and Symphonion. Tune lists for various sizes are available. Here are two examples of our work at opposite ends of the spectrum. Ship Ahoy! 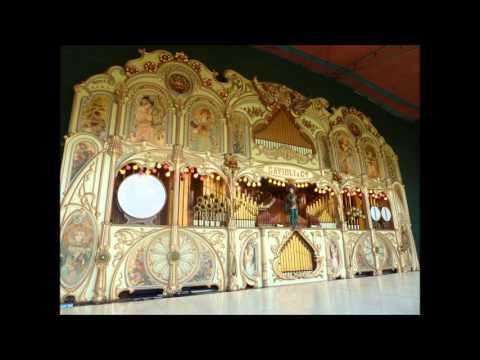 Preston's 112 Key Gavioli Scenic Organ "The Gavioliphone"
Preston's 112 Key Gavioli Organ "The Gavioliphone"